(28) Yet another “KB” credit could be seen on TV tonight when BBC Four re-screened the well-respected, 1999 documentary programme, It’s Slade. (25) Berkshire – With the 2013 Liverpool Beatles Convection fast approaching, Keith set to work researching/ compiling this year’s video show. (19) Windsor, Berkshire – Another afternoon meet and catch-up with the iconic, rock, 1960s/70s photographer, Mike Randolph. The reason? To plan/ publicise his forthcoming exhibition, Randolph’s Rock Icons, which runs at the Windsor Library in Windsor, Berkshire between the 3rd and 29th September this year. - Another Keith Badman credited programme hit the airwaves when BBC Four repeated (two times this evening) the “Director’s Cut” version of the 2012 documentary, Freddie Mercury: The Great Pretender. (18) Canada – Well I never. Marilyn made a surprise leap up to the No.4 position in the “Hot New Releases” in Biographies section on Amazon Canada, even beating the highly-anticipated new book, The Richard Burton Diaries, which stood at No.7. Get this. On the same day, Keith’s book was at No.8 in the “Amazon Bestsellers”, a chart based on the site’s “most popular products based on sales.” But what makes the feat so noticeable was that every other publication in the chart that day was available for sale at that very moment! Keith’s Marilyn was not scheduled to appear in the softback format until December 10 this year, still over 5 months away! (15) Italy – No holding it back, it seems. The Kindle edition of Keith’s Marilyn book climbed back up to the n.11 position in the “eBook Kindle > Arte, cinema e fotografia > Cinema e television” section on Amazon Italy. While on the same day, on Amazon Canada, the paperback edition, a little under 5 months before its release, was still seen in the No.8 position in the “Hot New Releases in Biographies” category. - The latest edition of Record Collector, featuring Keith’s ‘Doors Special’ reached the UK shops today. (13) Berkshire – A return visit for Keith to the home of the famed bistro belonging to Mr John Barratt, one of the country’s chefs, for another top night of chatting, philosophizing, socialising and (of course) eating. “His cooking is still not on prescription, sadly!” Keith was heard to remark afterwards. - Canada – Well I never. It’s still hanging in there. Keith’s Marilyn climbed one place to No.8 in the “Hot New Releases in Biographies” section on Amazon Canada. (12) Windsor – Another meeting with the famed photographer, Mike Randolph. Expect an announcement about this shortly. (5) Canada – It’s still there! Keith’s Marilyn was seen at the No.9 position in the “Hot New Releases in Biographies” section on Amazon Canada. (3) Berkshire – Keith completed his latest Rockin’ The Box for Record Collector magazine. Under the spotlight today was the January 1978 Granada show, What’s On hosted by the late, great Tony Wilson and featuring, amongst many others, Glen Matlock, Georgie Fame and The Buzzcocks. - Canada – Still on the up. The amazing run continues! Keith’s Marilyn climbed one place to 7 in the “Hot New Releases in Biographies” on Amazon Canada. And get this! The as-yet-unreleased paperback edition of the book was also seen in the No.88 position on the site’s “Amazon Most Wished For” category. 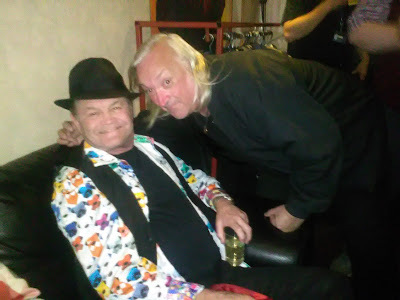 (2) Windsor, Berkshire – With a multitude of ideas in mind, Keith met-up with his old friend, the legendary 60s/70s photographer, Mike Randolph, best-known for his ground-breaking shots of rock icons such as John Lennon, The Rolling Stones and Led Zeppelin. (1) Canada – A new month…with more of the excellent same. The paperback edition of Keith’s Marilyn climbed one position to No.8 in Amazon Canada’s “Hot New Releases in Biographies” chart.